This book helps readers learn astrophotography directly from innovators in the field. It covers all types of astronomical image processing, using DSLRs, and deep sky, planetary, widefield, and high resolution astronomical image processing. There are currently thousands of amateur astronomers around the world engaged in astrophotography at a sophisticated level. Their ranks far outnumber professional astronomers doing the same and their contributions both technically and artistically are the dominant drivers of progress in the field today. This book is a unique collaboration of individuals world-renowned in their particular area and covers in detail each of the major sub-disciplines of astrophotography. This approach offers the reader the greatest opportunity to learn the most current information and the latest techniques directly from the foremost innovators in the field today. 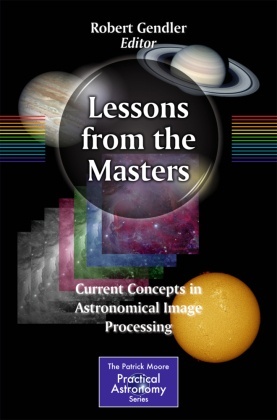 "Lessons from the Masters" includes a brilliant body of recognized leaders in astronomical imaging, assembled by Robert Gendler, who delivers the most current, sophisticated and useful information on digital enhancement techniques in astrophotography available today. Each chapter focuses on a particular technique, but the book as a whole covers all types of astronomical image processing, including processing of events such as eclipses, using DSLRs, and deep-sky, planetary, widefield, and high resolution astronomical image processing. Recognized contributors include deep-sky experts such as Jay GaBany, Tony Hallas, and Ken Crawford, high-resolution planetary expert Damian Peach, and the founder of TWAN (The World at Night) Babak A. Tafreshi. A large number of illustrations (150, 75 in color) present the challenges and accomplishments involved in the processing of astronomical images by enthusiasts. 1) Stan Moore -"Theory of Astronomical Imaging"
2) Ken Crawford -"High Dynamic Range Processing"
3) Jay GaBany -"Color amplification"
4) Ken Crawford -"Bringing out Small Scale Details"
5) Rogelio Bernal Andreo -"Bringing out faint large Scale Structure"
6) Don Goldman -"Narrowband Imaging"
7) Steve Cannistra -"Widefield Imaging: Strategies for Processing Light Contaminated Data"
8) Tony Hallas -"Noise Reduction Techniques"
9) Adam Block -"Deep Sky Imaging: Workflow 1"
10) Johannes Schedler -"Deep Sky Imaging:Workflow 2"
11) Steve Mazlin -"Deep Sky Imaging:Workflow 3"
12) Damian Peach -"High Resolution Lunar and Planetary Imaging"
13) Babak A.Tafreshi -"Nightscape Imaging"
14) Fred Espenak -"Eclipse Imaging and processing of the Solar Corona"
15) Alan Friedman -"Solar Imaging"
16) Robert Gendler -"Aesthetics and Composition in Deep Sky Imaging"
17) Robert Gendler -"Hybrid Imaging"